Christmas time is always SO cr-azy! Especially being a working mom I am being pulled 100 ways, but you have to make sure you don’t miss out on all the fun too! Earlier this week I jumped on the Facebook Live with two hilarious moms that I’m sure you’ve heard of… Kristin and Jen from #I-Mom-So-Hard! They were streaming live from a Walmart store, and sharing all kinds of awesome gift ideas for the people on their lists this year. 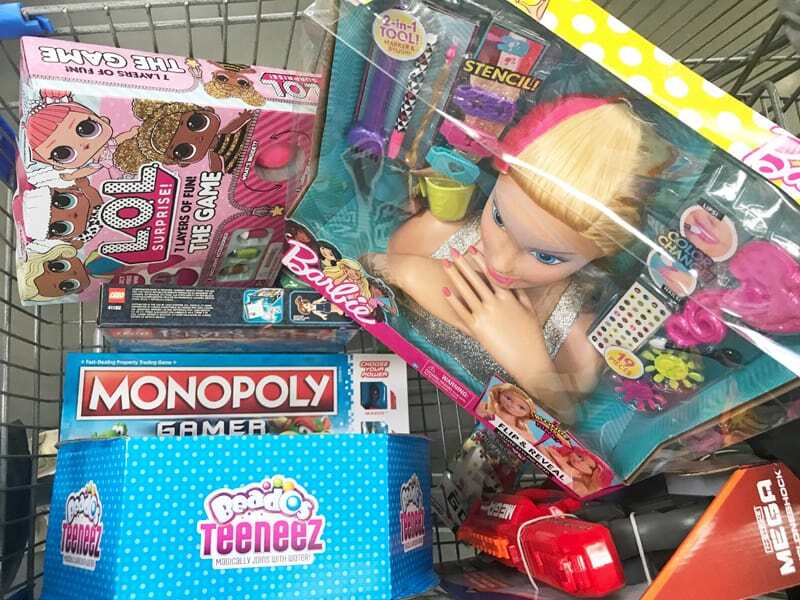 I wanted to share some of the amazing gifts I have found at Walmart for my family, and compiled some of my best finds into a list of my Top Toys & Games for Christmas 2017. Walmart always seems to make my job easy by providing so many great options for Christmas presents, while also having all the best deals! I already had a good start to my Christmas shopping, but I knew there were a few hot items I still wanted to buy for my kids! So, I headed to Walmart to finish up! Hopefully this list can help you finish up your Christmas shopping! I wanted to focus on the top toys and games, because that is always what takes me the most time to figure out! Pop Solo Karaoke Rose Gold Microphone – This microphone is on my list for my 4-year-old who loves to sing and perform! The bulky karaoke machines are a thing of the past… just download your favorite karaoke app, connect your smartphone to the microphone and your little performer can sing to his or her heart’s content! Barbie Deluxe Styling Head – When I saw this in the store, I was transported back in time to when I got one of the old school Barbie styling heads for Christmas! I loved being able to do her hair and makeup all by myself. My daughter would absolutely go crazy for the chance to be a professional Barbie stylist! This version has lots of fun color-changing features, including the ability to transform Barbie’s blonde locks into trendy pink with a flip of the hair from right to left. Then, just add water to the magic nail and lip applicator to transform Barbie’s nails and lips from light to dark pink! Disney Frozen Deluxe Troll Wedding Set – Frozen is making a comeback this year and this 5-piece set would make any little girl happy on Christmas morning! The set includes full-size dolls of Anna and Kristoff, dressed for their wedding with elaborate headdresses and beautiful capes over their traditional wintry outfits. It also comes with two troll figures and Olaf! It’s an exclusive set to Walmart, and for less than $20, it’s a steal for anyone on your list who loves Frozen. 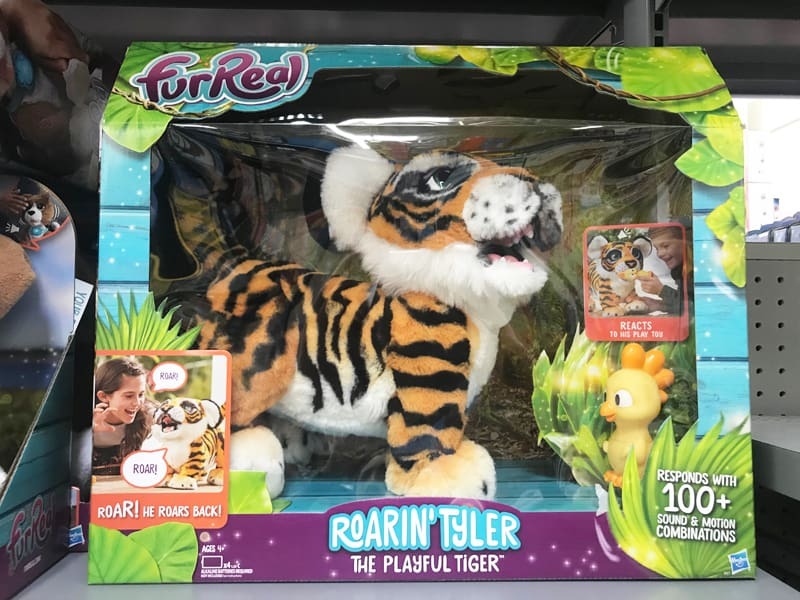 FurReal Roarin’ Tyler the Playful Tiger – A few years ago, I got one of the FurReal puppies for my daughter for Christmas and it is still a favorite toy at our house! This interactive tiger pet would be a perfect gift for boy or girl. It is very realistic, reacting to sounds and touch with over 100 different sound and motion combinations! Mayka Toy Block Tape – This is something that I’d never seen before and I was totally geeking out for my Lego-obsessed kids. This reusable tape instantly transforms virtually any surface into a base for toy building blocks, figures, and accessories. It’s totally compatible with Lego, Mega Bloks, Kreo, and all other leading toy block brands. I mean…. seriously, the building possibilities are endless! Nerf Mega ThunderBow Blaster – My boys love Nerf guns, but this “bow” version takes shooting targets to a whole new level! This long-range battle bow has flexing bow arms and can launch your arrows up to 100 feet! You can fire up to 5 mega darts at a time without reloading, and can interchange the mega darts from your other Mega Nerf guns too. Merge Cube – This cube is pretty dang cool! I’d never heard of it before I saw it at Walmart, and I can’t wait to see what my 10-year-old thinks. 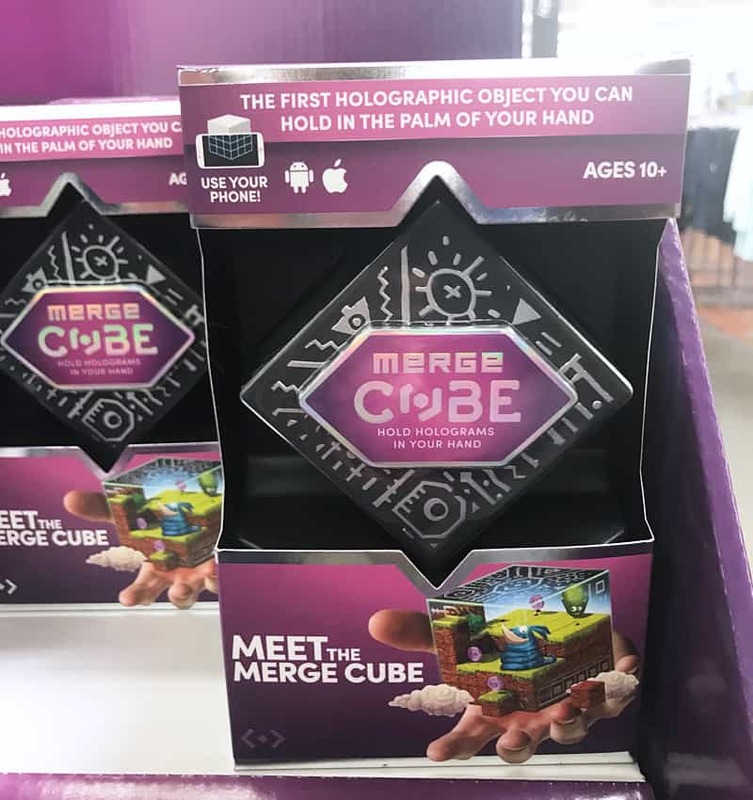 The Merge Cube is the world’s first holographic object that you can hold in the palm of your hand! Just download apps using your tablet or smartphone, view the cube through your device’s camera, and watch the Merge Cube come to life. You can enhance the experience by selecting the optional Virtual Reality mode, then slide your smartphone into your VR goggles to enter a holographic world! Monopoly Gamer – Monopoly meets Nintendo for this classic gamer collaboration! The board game features Super Mario characters, each with their own special powers and abilities. Players earn points by collecting coins, buying properties and beating bosses, including Bowser at the game’s end! You can buy additional characters to increase the number of game players beyond 4 people. I can’t wait to play this game! Disney Apples to Apples – Apples to Apples Jr. is one of the most played games in my family… from the oldest to youngest kids, everyone can participate and it’s fun for mom and dad too. So I was really excited to discover this Disney version! It would also make a great family gift or neighbor gift that all ages can enjoy! L.O.L. Surprise Game – L.O.L. dolls are one of the hottest items this Christmas… if you can find them in stock anywhere, count yourself lucky! If you are having trouble finding one of the actual dolls for your little girl, I bet she would adore this board game! An extra bonus, it comes with 4 exclusive accessories that fit L.O.L. Surprise dolls too! Codenames Pictures – The original Codenames is one of my favorite games! It’s great for adults, but a little too challenging for our kids, so I was excited to find this version with picture clues instead of words. Players give one-word clues that can point to multiple pictures on the board and their teammates try to guess the pictures of the right color while avoiding those that belong to the opposing team. The first team to correctly guess all of their color agents, without choosing the assassin, wins! 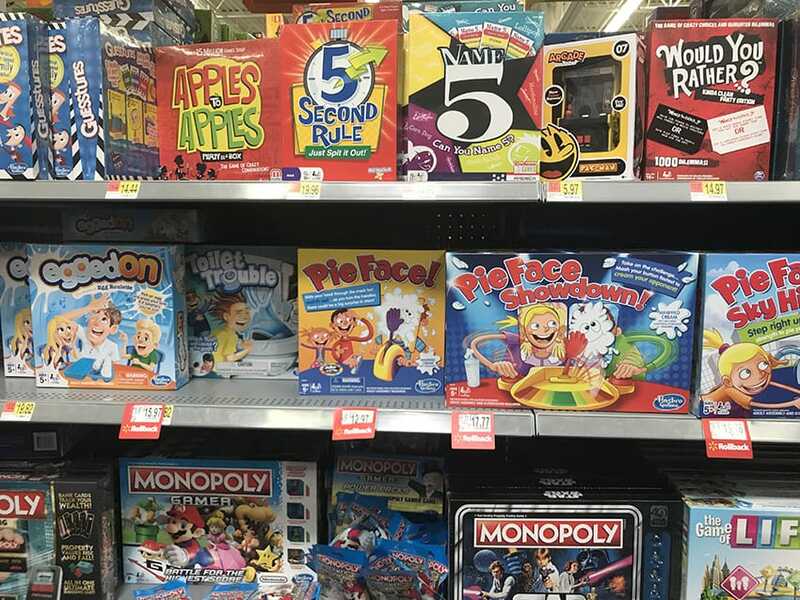 Hearing Things – Have you heard of the “Whisper Challenge?” This new game is Hasbro’s version where you guess what you think your teammate is saying by reading their lips. The game comes with speech-cancelling electronic game headphones, and 150 cards with 600 phrases. I can only imagine the laughing that would be involved with my boys playing this game! The Game of Things – This is one of my favorite games to play with friends at parties or game night (after the kids are in bed!) To play, a topic or question is read aloud and each person writes down a response. Then all the responses are read aloud and you have to figure out who said what. It is always funny to see who says the things you least expected! Jumanji – I was so excited to find this nostalgic board game back in stores! (It’s only available in Walmart stores, not at Walmart.com.) I remember playing this game with my friends, and now with the new movie coming out on Christmas day, this is a perfect family game gift! 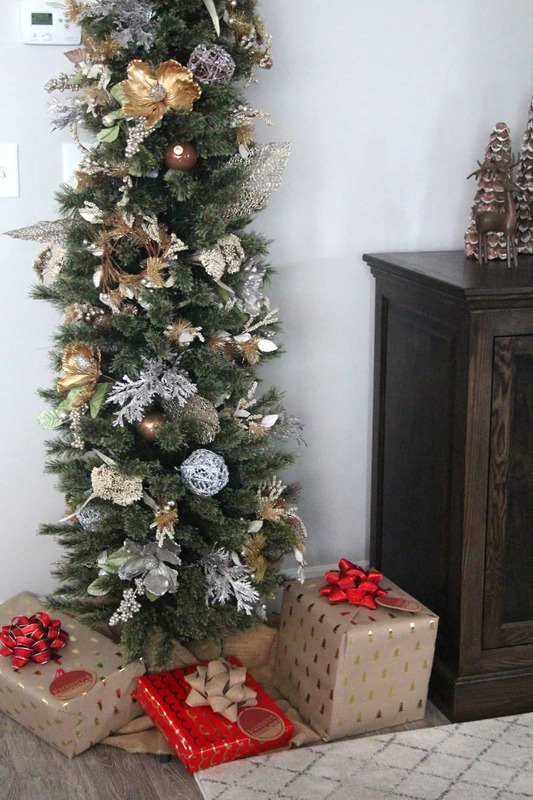 I hope these ideas help you finish up your Christmas shopping for the year! Don’t forget Walmart is a great place to get “stuffers” too! I also grabbed socks, undies, toothbrushes, toothpastes, gum, chapstick, etc. on this trip! Now I’m ready to enjoy the last couple weeks of the holiday playing with my family!